The greatest joy in my life (after being Christ’s follower and D’Ani’s husband) is being the earthly father and steward of my three boys: Kai, Kaden & Karter! Everything else pales in comparison to the joy they bring, which says a lot! The older I get, the more I love them for not only the fact that they are a byproduct of the union between my wife and I, and that they are my seed; but I am growing to love their individual uniqueness and worth. They are special, in every sense of the word! This past week has given me the opportunity to both enjoy them and learn them. Spring Break has never been a big deal for me, even when I was younger. I suppose I would be deemed a ‘square’ or ‘boring’ in that I always viewed Spring Break as just that: a BREAK! If I did nothing at all during this time, I felt I was missing nothing at all. Even at a young teenager, I felt as if I had a book, television, a roof over my head with air conditioner, and a good meal at my disposal, I was on top of the world! I actually enjoyed watching some of the Spring Break parties that would come on MTV thinking to myself, ‘….this is fun. So glad I’m not out in that crowd getting sunburned or drunk!’ I can tell now – that 1) I was a weird dude and 2) my sons are pretty much a different breed. My guess is they get it from my lovely wife!!! The Friday before Spring Break, my 10 and 7 year old boys knew what time it was, including the movies that were out, etc. I must admit…they are such a joy, amid my seeming inability to keep up. I have somehow known, even as I youngster (there I go again. I’m starting to sound like ‘older’ people who are always referencing they ‘youth’) that I should seize the moment and take full advantage of the present ride. Therefore, I’ve always had a sense in my collective conscience at present, ‘I’m going to one day miss these days.’ I’ve felt this way ALL WEEK. I’ve sat back and looked at my boys, observed their interactions with one another, their response to certain things, what makes each of them laugh or get frustrated; how they remind me of me or their mother or someone else in our family, including their physical features. It’s amazing! I see myself in each of them – the good, the bad and….well, you know the rest! I want so much for them to be a better man than me. I want them to be a better husband and father than me. I want them to be a better follower of Christ than am I. If they were ever called to preach, I’d want them to be a better preacher or even pastor than me. Words cannot entail how much I want for them. I sometimes wonder if they can ‘feel’ my love, or even if I show my love to them enough. My father did such a wonderful job of exemplifying love to me. He both expressed it and said it. At times I’ve felt his disappointment and even his wrath (like the time I climbed over a gate or went into a girl’s purse), but I can never recall a time that I couldn’t feel the love of my Dad. I hope and pray my boys can feel the same way. I can often feel I am the hardest on my oldest, Kai. It’s just not fair for him! He’s a good son. But he’s also the oldest and my leader. I would always expect him to lead the pack when it comes to looking after one another when I am gone (a long time from now, I pray). He is the one I pray would be the example to his younger brothers in how to conduct themselves in the home, at school, with their mother, at church, etc. Therefore, my disappointment can sometimes tend to be a little more evident when it comes to my expectations. But I must also realize he is not perfect. I have to understand that he is a boy! Therefore, I am learning to share my expectations and my love for him amid the shaping of his own identity. It has been amazing to see him grow, and to even eat us out of house and home. My middle son, Kaden, is absolutely one of a kind. All of my sons are so much smarter than me; but Kaden’s mind is that of an Einstein. My conversations with him, should I say, his conversations with me, are mentally stimulating. I could go on and on all day, including a couple of years ago when Kaden was about 5, getting in trouble with a girl who had been getting on his nerves, his rebuttal was, ‘She’s melodramatic.’ What? Interesting! My greatest challenge with Kaden is redirecting all of his energy, giftedness and genius in a right direction, including his attitude. He must be broken; but he must be broken like a stallion – where his attitude is broken but not his spirit. I am sensitive to this; and I am asking God to direct me with him. Kai is my boy for life; Karter is my baby; Kaden is my heart. If there is anything or anyone who can wear me out, it is him. Lord, help us! Karter….as I said, is my baby boy! He is the final act!!! He seems to be Kraig Pullam re-born. I can’t say much about his flaws, simply because, like most baby’s in the family, it’s hard to see his flaws. 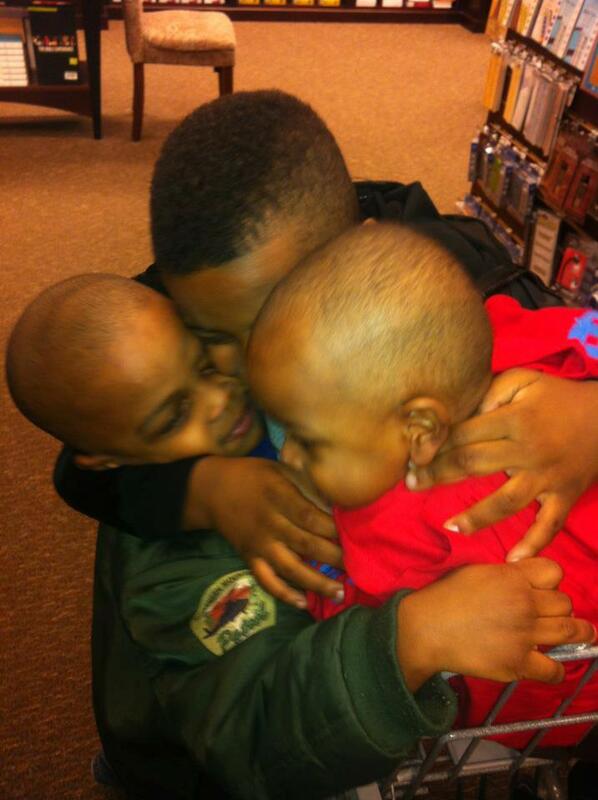 Moving on… I hope and pray that I can make them proud one day to say they are my sons and I am their father. I have a lot to learn; and so much farther to go. Often I feel inadequate as a man who wants to be a better preacher, go back and begin doctoral work, grow my church, build their college fund. etc. They don’t care about any of that. The most important thing to them this past week has been ME. They’ve just wanted me. Thankkfully, I am smart enough atleast to know this may not always be. It has also caused me to reflect on how my aging parents must feel now that I am gone, and fail to spend the time I should with them. My challenge now is simple: balancing all of this. Living in an occupation where many are thriving in preaching and pastoral ministry at the behest and detriment of their families, I have seen many preachers who prioritize family and suffer in preaching and pastoral ministry. By the grace of God, I have been fortunate in ministry, all while making time for my family. I honor pastors and preachers who do the same. And I pray for those pastors whose homes have become difficult places to reside. Some, I believe, are victims even in their own homes, but that is another blog. I thank God for a wife who has prayed for me and lifted me to become the man, husband, son, father, servant and pastor God has called me to be. This work would be so much more difficult if we weren’t working together these 14 years. What are your thoughts? How was your Spring Break?